It's been a while since I've been in touch-- things have been super busy! Im very happy to announce that I just (three weeks ago) moved back up the coast to the Bay Area, compelled by the arrival of my new baby niece and a desire to be nearer to my long time home of San Francisco. My work will continue to appear around Santa Cruz, however, at Felix Kulpa Gallery, the Hide, and elsewhere, so if you're based in that lovely land, I hope you'll continue to keep an eye out for my work. I also gotta take a second and give a big shout-out to San Mateo City Arts, who welcomed me to my new digs with an acceptance to their upcoming group show Red in January, 2008...and also awarded me with a solo show upcoming in 2008 at the San Mateo City Hall Art Gallery (!). Thank you to San Mateo City Arts, and to their curator, Sinem Banna. I am very honored and excited! Despite having been up-to-my-eyeballs in bubble wrap and cardboard these past couple of months, I've managed to book the following shows. I hope you'll mark your calendars, and feel free to help spread the word! Thanks so much, as always, for your support. 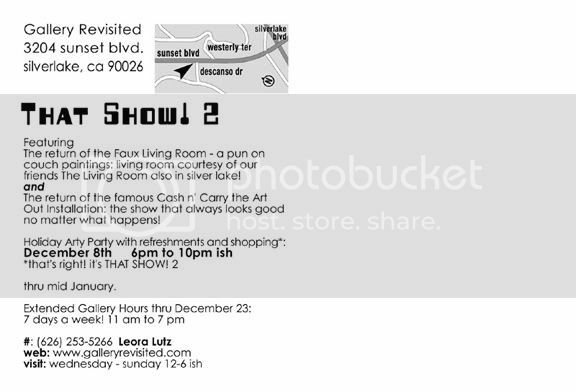 I have a piece in the group show at Gallery Revisited (in Silverlake) coming up in December. The show, That Show! 2 opens tonight, this Friday, December 7, 2007. Check out www.galleryrevisited.com for details, or check out the postcard, below. You can get a sneak preview of the show if you like (I recommend it...it's pretty stunning), by clicking here. I also have a couple of pieces in the beautiful Winter Wanderland installation at Truxtop Gallery through mid-January. Check out www.truxtopgallery.com for details, and scroll down to see the postcard image, as well as pictures from the opening. My piece, A Little Bird Told Me, was selected to be in the juried group show Red upcoming at the San Mateo City Hall Art Gallery, in January, 2008. As stated above, I also have a solo show at the San Mateo City Hall Gallery in the 2008-2009 season by the San Mateo City Arts Council. I will send out mailings with details prior to these openings, but for more information, check out www.ericasteiner.com, or http://www.cityarts-sm.org/. I have three new pieces at the We Are Felix group show at Felix Kulpa Gallery, up through the end of the year (www.felixkulpa.com for hours & location info). I also have a two-person show in the works at the Hide Gallery (dates to be determined). 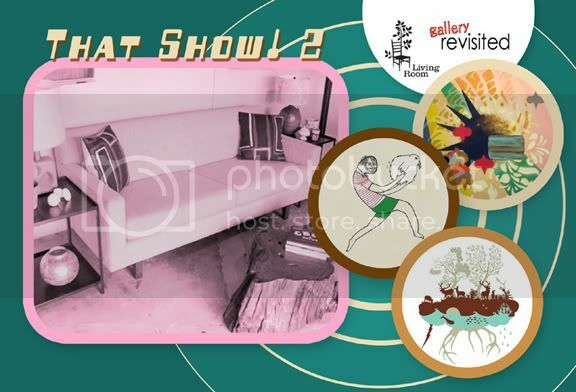 The Love Show, upcoming at LaunchPad Gallery in February. Aaron Castro, my husband, will also have a piece in this show. More info soon. As always, feel free to send me an email at Erica@ericasteiner.com, and check out my website, www.ericasteiner.com, to get the lowdown on all the goings-on. Thanks again for your support, and may you all have happy, restful holidays! Published on December 08, 2007 .